This article is about the musical scale. For the programming language, see C Sharp (programming language). 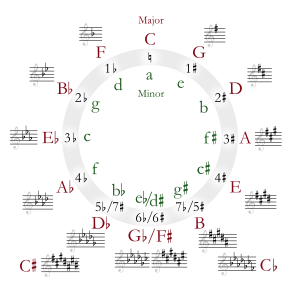 C-sharp major (or the key of C-sharp) is a major scale based on C♯, consisting of the pitches C♯, D♯, E♯, F♯, G♯, A♯, and B♯. It is enharmonically equivalent to D-flat major. Its key signature has seven sharps. Its relative minor is A-sharp minor (or enharmonically B-flat minor) and its parallel minor is C-sharp minor. A harp tuned to C-sharp major has all its pedals in the bottom position. Because all the strings are then pinched and shortened, this is the least resonant key for the instrument. Although most composers prefer to use the enharmonic equivalent D-flat major, since it only contains five flats as opposed to C-sharp major's seven sharps, Johann Sebastian Bach chose C-sharp major for Prelude and Fugue No. 3 in both books of The Well-Tempered Clavier, and Charles-Valentin Alkan chose C-sharp major for Etude Op. 35 No. 9 "Contrapunctus" in Twelve etudes in all the major keys, Op. 35. In Hungarian Rhapsody No. 6, Franz Liszt takes the unusual step of changing key from D-flat major to C-sharp major near the beginning of the piece. Maurice Ravel selected C-sharp major as the tonic key of "Ondine" from his piano suite Gaspard de la nuit. Erich Wolfgang Korngold composed his Piano Concerto for the Left Hand, Op. 17, in the key of C-sharp major. In a few scores, 7-sharp key signatures in the bass clef are written with the sharp either for the A or for the A and the B on the top line. Louis Vierne used C-sharp major for the "Dona nobis pacem" of the Agnus Dei of his Messe Solennelle in C-sharp minor. The table indicates the number of sharps or flats in each scale. Minor scales are written in lower case. This page was last edited on 10 January 2019, at 22:51 (UTC).